Kakuju, in some references, is the sister of Sugawara no Michizane and in others his aunt. She is cast in one of the major roles in the kabuki play Sugawara's Secrets of Calligraphy (Sugawara denju tenarai kagami). 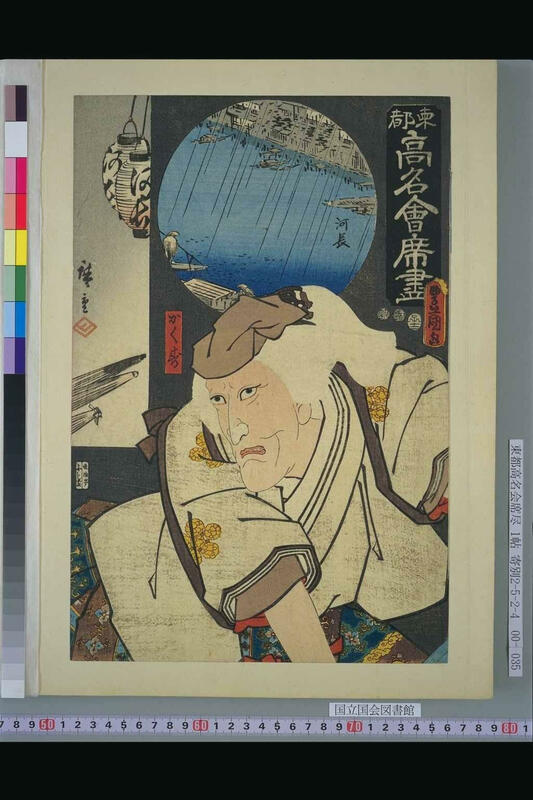 If you look closely at the upper left of this print, the one with Hiroshige's signature and seal, you will notice the name of the restaurant, Kawachō (河長), written on the lantern. Below that, at the bottom of the oblong, vertical cartouche are three closed umbrellas. These go with the round river scene in the rain seen above the actor's head. Supposedly the Hiroshige images in this series represent scenes seen in the neighborhood of the named restaurant on each print. Notice the beautiful oxidation on the actor's robe. There are at least 50 prints in this collaborative series. Not only does this series feature two of the greatest diversions of the Edoite population - fine dining and kabuki - but it gives us a who's who of great actors, performances and roles. A full study of this series would be extremely rewarding. 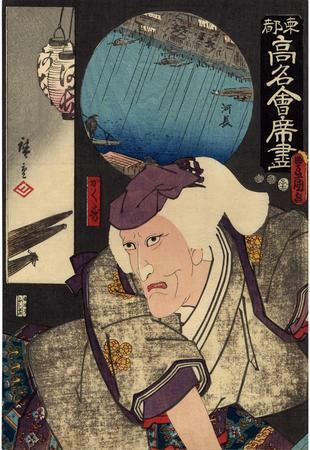 Illustrated in black and white in volume IV, Hiroshige and the Utagawa School: c. 1810-1860, 1984, pp. 98-99.